One of the splendid things about life in Bangladesh is having clothes tailor-made. Block printed vegetable dye cloth and made in Bangladesh. You can select every detail of the clothing and they can make it for you (or better yet, give the tailor a sample to copy). Or if you want to be on the cusp of fashion, you can shop from a fashion designer. Buy the cloth. Let them tell you how much you’ll need. Take the cloth home and wash it to allow for shrinking. Buy decorations, edging, trim which is called “ribbon” here. 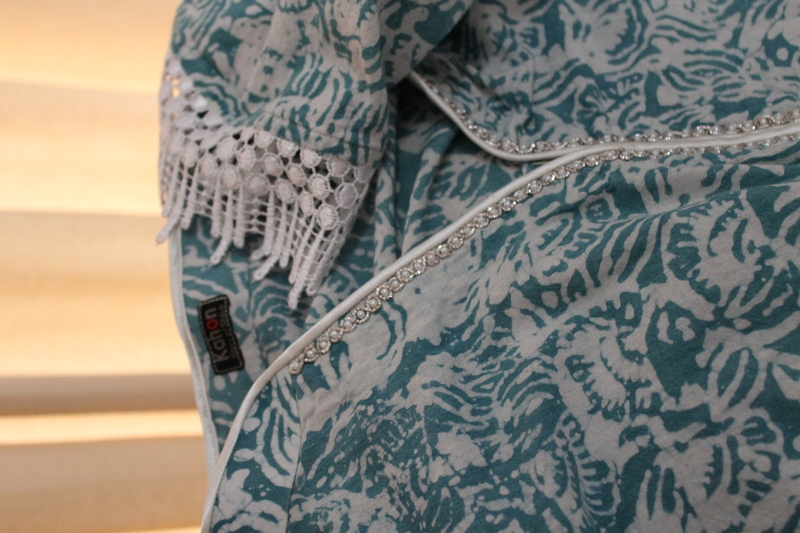 Western-style shirt made from popular saree material. Take to your favorite tailor and have them sew it for it. If you take a sample of something you would like copied or a print out from the computer, the tailors will have an easier time of copying your design. Some can turn it around in a week. Others take four. Keep trying out different tailors or stick to one that you like. It costs (for an expat/foreigner) about 600 Taka ($8) for the tailoring. The cost of the cloth depends on what you buy. For a business style shirt (like at Banana Republic or Ann Taylor) of high grade cotton from India, it would cost around 800 Taka ($10) for the material itself. So, economically speaking, you can buy cheaper clothes (even here) ready made. But it’s much more fun to design the clothes yourself! In another posting, I will show more of what expats are wearing here in Dhaka. hello, Ive been reading your blog, mainly because I love reading about Dhaka. I lived there as a 13-15year old. My Dad was working with the (E.P.) govt then, with a Canadian firm, installing electricity. I have never forgot my time there, I used to cycle everywhere, and met many people. Taught to fly a kite, put glass on the string, fish, go on little boats on the lakes. People would always treat me so friendly. lovely place. I loved walking around New Market. Your blog made me wonder if its possible to get a hand made denim jacket there, and how it could be done, and whether you knew any tailor. Mass produced is never exactly right, and it would be a real treat to get one made. I used to have my trousers and shorts tailor made there. Usually I was just in shorts, t-shirt and sandals. I now live in Brighton England. It would be nice to hear from you. Best wishes, Kevin Jones. Thanks for reading my blog! I am glad to hear that you like reading about Dhaka. New Market is still great and the prices there are cheaper if you bargain. You can still have almost anything made here including denim. The cost of sending clothes by courier negates the cost cavings. Hopefully you will visit Dhaka again and can go to your favorite tailor. I am going to Dhaka next week and hope to find a tailor who can help me make incontinence pads for a woman’s charity. Do you have any contacts? You are working on a serious issue but I do not know of anyone who specializes in that sort of thing. If what you want is made of cloth, my advice would be to give a sample or drawing of what you want. It’s a very modest country so I’m not sure how people would react to what you want made. Also, there are many tailors all over the city so you should be able to get some made. Sorry, but I do not have any contacts. It should not be too expensive. We are looking to hire Bangladeshi tailors to work in Lagos, Nigeria. Any contacts? Sorry, no contacts. It is best to come here and make your arrangements. Hello Kevin, interesting journery you had there :), i wondered were i can get a contact i Dhaka to a tailor. Im from Denmark, and don’t have opportunity to go there in the near future 🙂 ? you know anything ?